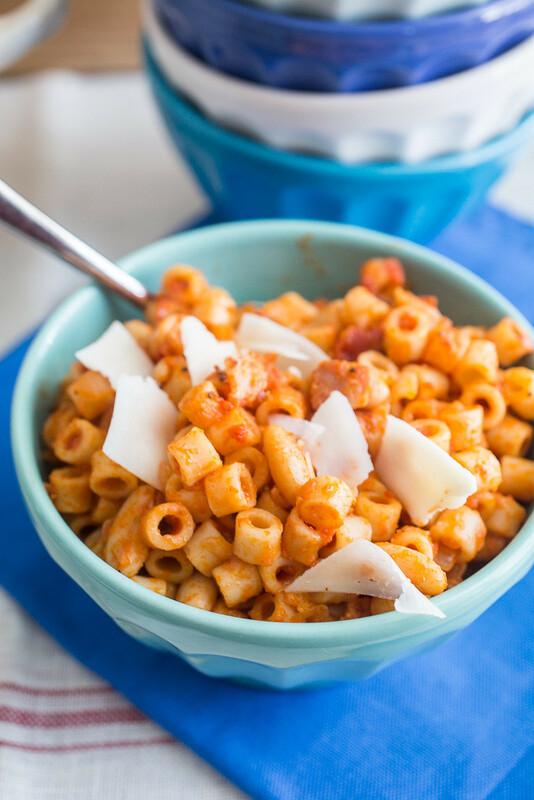 This pasta e fagioli is my family’s 3rd generation absolute favorite version of the traditional Italian dish. 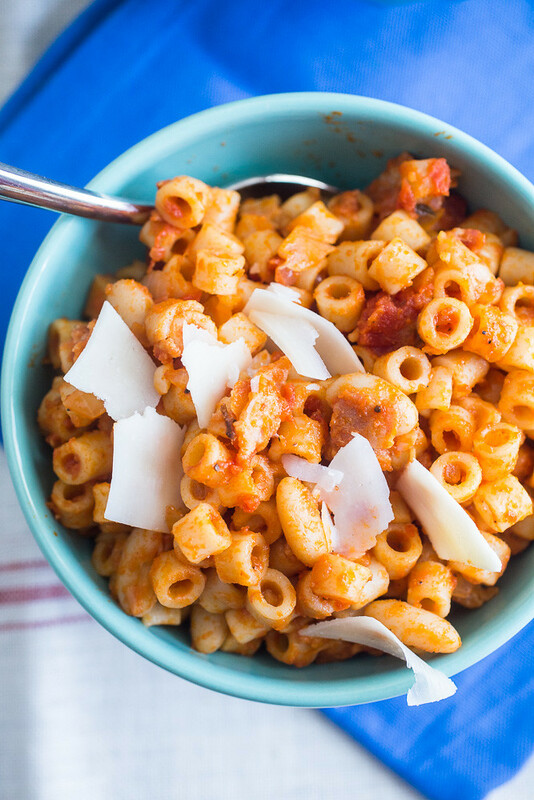 It’s pasta and beans (literally, pasta e fagioli) and bacon in a hearty, spoon-required, comfort food, non-soup form. To this day, I can name a handful of distinct meals from my childhood that will forever be burned in my memory. Chicken parmagiana. Sausage and pepper pasta. Turkey chili. Spaghetti with dad’s Sunday gravy. And this pasta e fagioli. Time, place, people and conversations immediate come back to me when I think of them. They are the meals my family and I reminisce about. Now the truth is, if you ask 20 Italians about their family’s pasta e fagioli recipe, you’ll get 20 different versions. It’s just one of those meals that is so adaptable and oftentimes, you’ll see it in a soup form. This, is not a soup version. It’s pasta and beans (literally, pasta e fagioli) in a hearty, spoon-required, comfort food form. Chopped bacon, onions, and garlic are the base. 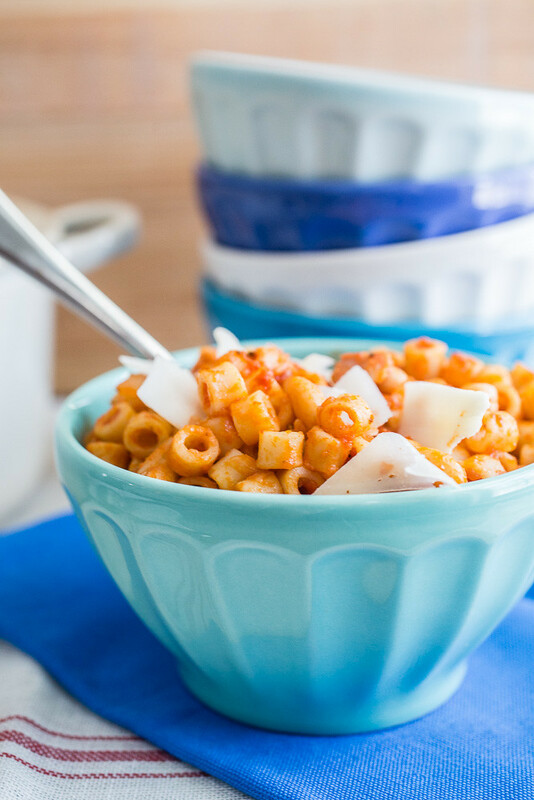 Marinara sauce – either store-bought or leftover homemade sauce if you have it – and oregano are added and then a can of cannellini beans, grated hard Italian cheese (parmesan, pecorino-romano, etc. ), and cooked ditalini (tiny tube pasta shapes) are mixed in and heated through. My mom learned how to make this from my dad’s mom (my Italian grandma, not the booze balls grandma) sometime in the 70s or very early 80s before she passed away and this is still the exact same version. I’ve tried swapping the bacon for pancetta and adding fresh herbs like thyme and basil but there’s really no need to deviate; it’s been just the perfect recipe all of these years – and in fact, the addition of pancetta was just not right at all. This pasta e fagioli is one of those meals that I can make with my eyes closed and it’s one that I’ll never stopped making. Not with the memories it always brings back. 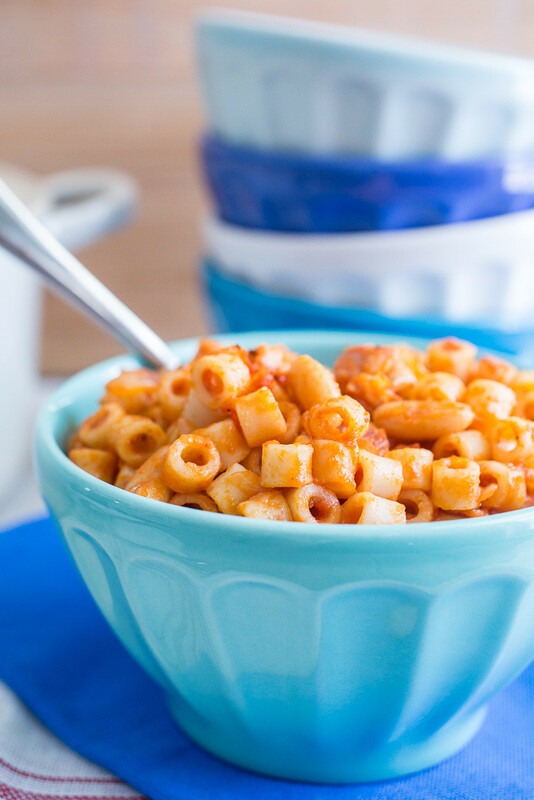 This pasta e fagioli is GREAT as leftovers – sometimes better than the first day! – but the pasta does tend to soak up quite a bit of the sauce when refrigerated. I usually keep some extra sauce on hand to stir in before we reheat it but it will be fine if you don’t have extra to add too. In a large sauce pot or Dutch oven (at least 4 quarts), cook the bacon over medium-low heat until it starts to brown but isn’t crispy yet. Increase the heat to medium and add the onions and garlic, season with salt and pepper, and add a drizzle of olive oil if the bottom of the pot seems a little dry. The salt will draw some of the liquid out of the onions but if there isn’t enough fat from the bacon (which happens sometimes), the oil will prevent sticking and burning. Cook the mixture until the onions are translucent, about 5-7 minutes, stirring occasionally. While the onions cook the pasta according to package directions. Drain and pop a large pot lid on top of the strainer if the pasta finishes before the bean sauce. Stir the about 30 ounces of the sauce, oregano, and beans into the onion mixture. I always swish a little hot water around in the sauce jar to clean it out and then pour the saucy water into the pot. Waste not want not. Simmer for 5-10 minutes, stirring occasionally, while the pasta cooks. Mix the cheese into the sauce and then mix in the pasta. Season with salt to taste. The dish should taste a little salty with the bacon and grated cheese. Lower the heat to low and allow the pasta to heat through the sauce for a couple of minutes, stirring occasionally to prevent it from sticking to the bottom of the pot. Serve hot with extra grated cheese sprinkled on top. Hi Cara! Yes, so many recipes are like this, aren’t they? This one, in particular, is one of those dividing recipes – either you make/like the soup version or you make/like the non-soup form – and there’s no crossing over! 🙂 I hope you love this recipe as much as we do – please let me know how it turns out for you.